Sevens action moves to Nairobi on Saturday September 15, 2018 for the last leg of the national sevens circuit, Christie 7s hosted by Kenya Cup side Kenya Harlequins at RFUEA Grounds, Ngong road. Quins have invited two foreign teams, Uganda emerging 7s and a combined side from Blue Bulls and TUKs from South Africa. The third team to be invited, likely to be a local side, is yet to be announced. Strathmore Leos won Dala 7s Div II title to earn promotion and will be the 16th ranked team. Christie 7s Div II matches will be held at Impala Club. The national Sevens circuit promises an exciting finale as series leaders Homeboyz, at 100 points, and Mwamba, at 92 points, will be seeking to win the overall title. 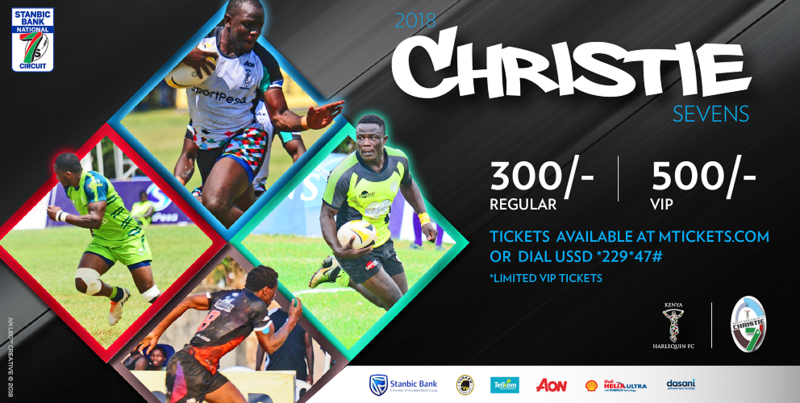 "This year's tournament will be the 54th edition and planning for the same commenced immediately after the previous edition," said Kenya Harlequins who "expect to deliver a tournament of very high standard" The Christie 7s after parties will be held at the famous Quins bar courtesy of Tusker.